Honda only utilise 4-stroke engine technology for better fuel economy, lower emissions and quieter operation across the range. Whatever the application, if you’re looking for a pump that’s easy to start, easy to operate and built to last - look no further than a Honda. This superb general de-watering pump can move 140 litres of fresh water per minute through its 1-inch pipe. 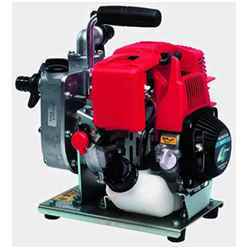 This clean running 4-stroke engine is ideal for drainage, irrigation and all-purpose cleaning. Widely used for clearing floodwater and with a suction head lift of 7 meters it is often used for draining flooded cellars or boats. It is very lightweight at 6.8 kg and the easy carry handle makes it highly portable and ideal for easy movement to wherever it is needed. Honda is the premier source for lawn and garden power equipment. Each and every product has been engineered to meet the high standards of the Honda tradition. Honda's legendary engine technology offers highly efficient, quiet, environmentally-responsible power for a wide variety of outdoor power equipment. Designed for your convenience, these products will allow you to maintain your lawn and garden in less time and with better results. Honda Power Equipment doesn't require any mixing of oil and gas - they run on gas alone. Thanks to Honda's advanced 4-stroke engine technology, Honda Power Equipment uses less gas and oil than conventional two-stroke engines.